The center-left candidate for German Chancellor Martin Schulz, known lovingly as "The Schulz," is having a moment. Taking a cue from President Donald Trump's surprise victory in November, Schulz's fans are flocking to social media to half-satirically promote his vision to "Make Europe Great Again"—through the promotion of universal values, rather than isolationism, to solve the continent's many crises. 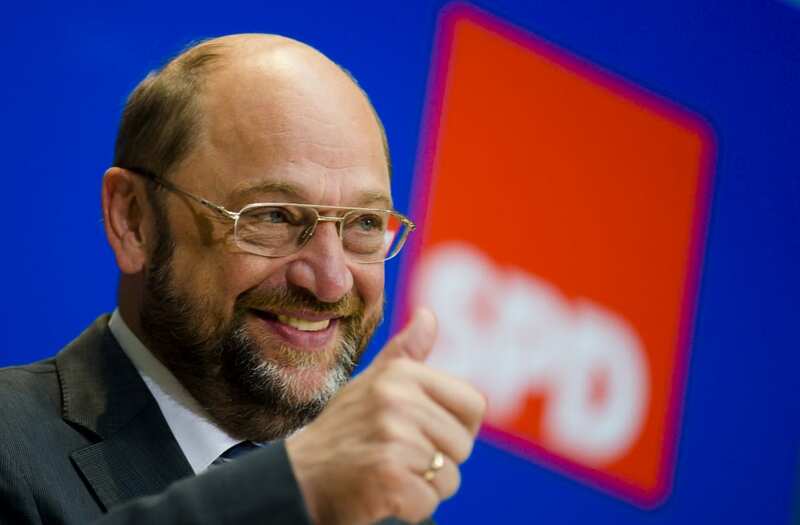 The former president of the European Parliament, Schulz is bringing his Social Democratic Party of Germany (SPD) to the forefront of the polls, posing a real threat to the Chancellor Angela Merkel for the first time since 2006. That progress is reflected in Schulz's growing social media following, which, including Twitter and Instagram, is over 871,000 users—almost double that of Frauke Petry, and quickly approaching the size of Merkel's, which is just over a million. Over the last year, Schulz and his party have outpaced both Chancellor Angela Merker and far-right Alternative for Germany (AfD) candidate Frauke Petry in drawing new supporters online. Vocativ analysis of German Facebook shows an impressive 296 percent spike in new likes on Schulz's page by users in Germany, jumping from 37,000 to 146,087. Over the same period, Angela Merkel's likes grew by a rate of 23 percent, from 451,372 to 558,466; and Petry experienced a 115 percent jump, from 72,826 to 156,904. Schulz was picked to lead the SPD last month after a two-and-a-half-year term as the president of the European Parliament, where he advocated for greater integration within the EU. His quick growth ahead of the September parliamentary elections echoes Donald Trump's own social media engagement strategy, which had been credited in helping him clinch his unexpected victory over Hillary Clinton. An impassioned fanbase on Reddit going by the name of "Schulzenbrothers" have created the "Schulzzuglied" (Schulz train song), which has already garnered almost 150,000 hits, according to the German newspaper Deutsche Welle. "Good luck! Good luck!" the song goes. "The Schulz train is rolling! And he has no breaks, travels at full speed into the chancellery, into the chancellery."